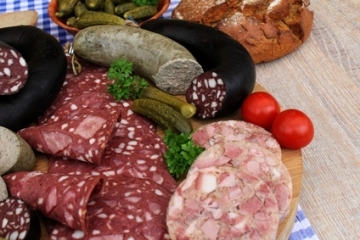 about us - Räucherspezialitäten PFAU - original Black Forest smoked specialities. Hand-crafted quality products as an essential part of cultural life. For over 40 years we have been following this guiding principle and producing our original Black Forest smoked specialities. They are regarded as a very special delicacy - a true pleasure for gourmets and connoisseurs. 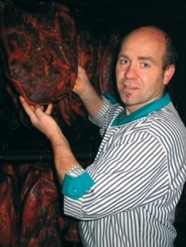 It all began with house slaughtering, typical of the Black Forest at the time, by the senior manager and master butcher Erich Pfau. 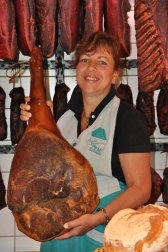 The production of Pfau's fine smoked ham from the Black Forest, smoked sausage and tinned sausage first only catered to a small clientele but sales of smoked specialities soon expanded due to word of mouth marketing by the numerous holidaymakers. What was originally established as a speciality business by the senior managers Erich and Brunhild Pfau is today a second generation business operated by Frank and Birgit Pfau and still employing the old traditional methods. 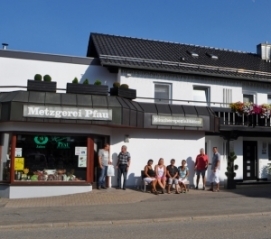 When visiting the Räucherspezialitäten Pfau company in Herzogsweiler in the Black Forest, you will find an unparalleled jewel in a wonderful atmosphere - nestled in the picturesque pine forests. Up to this very day the local methods of production have been preserved and the natural curing process is still being further developed. 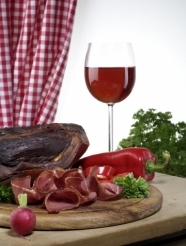 Characterised by a full-bodied taste and a robust aroma, our homemade specialities are also valued by the best top-class restaurant, Hotel Traube Tonbach in Baiersbronn/Tonbach.